Very interesting photo received from Malcolm Fare (UK) who is writing a history of the parish of Hanley Castle. Photo shows Sir Edmund Lechmere (1865-1937) of Rhydd Court. 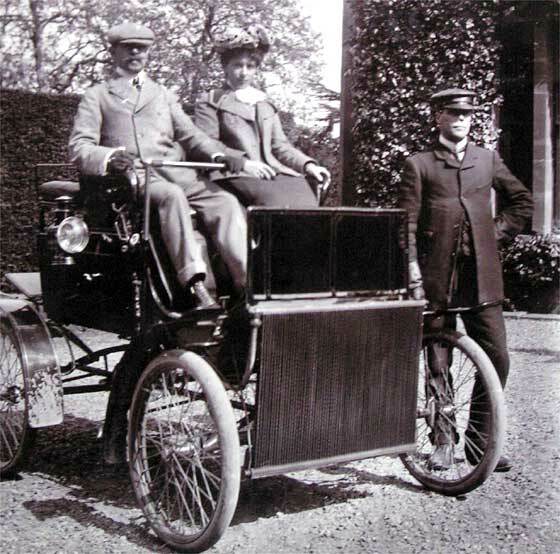 -- Stanley Brothers made a steamer in America in 1897 and sold the rights to Locomobile (US). Soon after owners split up forming Locomobile and Mobile, almost identical. On closer study car has Dos-a-Dos coachwork etc and is therefore cca 1901 Mobile Victoria Runabout. Condenser for UK market. Grainy photo repaired supplied by Robert (UK) who is investigating John Matthews. 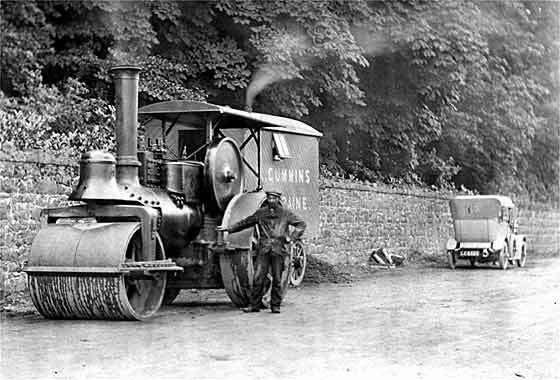 The picture was taken in Alton approx 1903 and reproduced in the Hampshire Herald in 1978 and in Family Tree magazine in 1999. This is a photocopy of a copy! -- We can advise that this is a steamer from the USA and is the other part of the first Stanley car being a cca 1901 Locomobile Steamer. (See above). 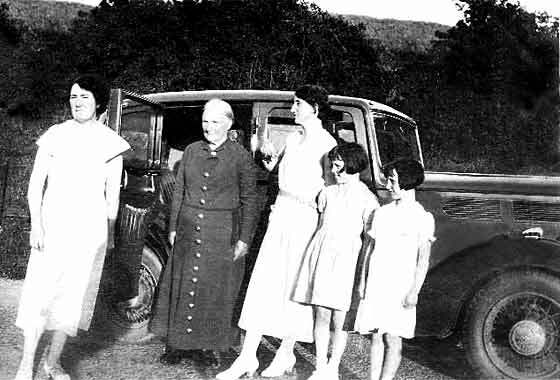 Body is unusual in being steered from the rear seat, - with passengers facing forward. 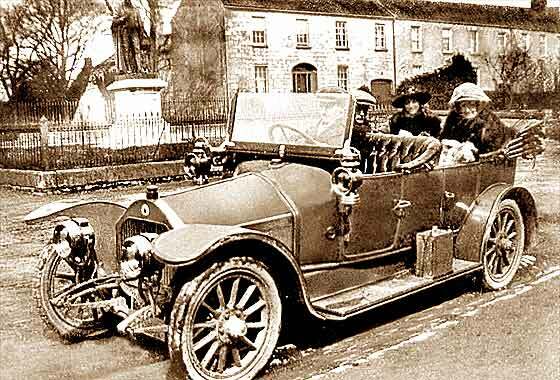 Photo submitted by Ian Carmichael (UK) showing his grandfather (1871-1956) in a car he owned when young. On the back it says Arrol-Johnson but Ian remembers him mentioning a De Dion-Bouton. --Confirmed by our John Warburton that this is not an Arrol-Johnson, nor is it a De Dion-Bouton. John's thought is a Lacoste et Battmann, sold under many names including Regal, Canterbury, Cupelle, Achilles, Speedwell and at least a dozen more. Most did have De Dion engines. 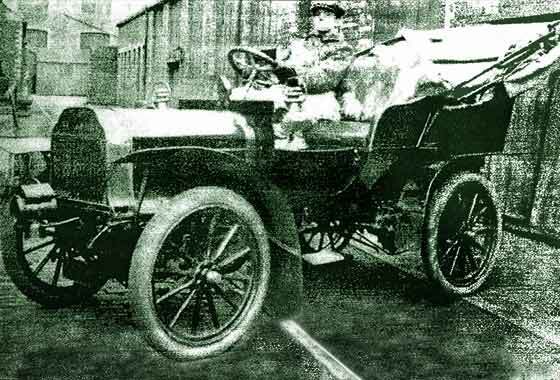 Photocopy of a newspaper picture sent in by Alan Milbank (UK) who found it published in an Isle of Wight publication trying to identify the vehicle. -- The photois very low resolution with little detail showing but we are nevertheless relatively sure it is a cca 1904 Argyll 10'12HP Tourer. 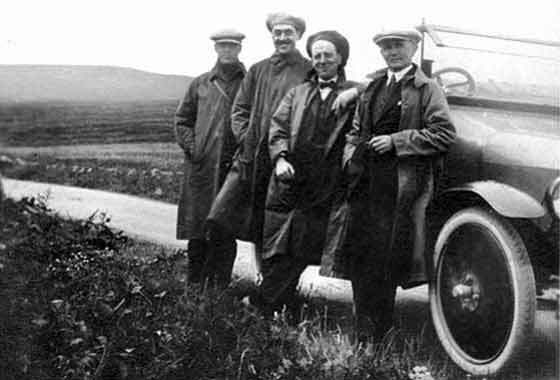 Argyll began manufacture in 1899 in Bridgeton, Glasgow, 1899 and became the biggest car manufacturer in Scotland. After a move to new factory in Alexandria went bust 1907. Reformed went on to 1932. Nice period photo received from David Fayle, Ontario (Canada) showing his grandfather's car outside his house in Birr, County Offaly, Eire. 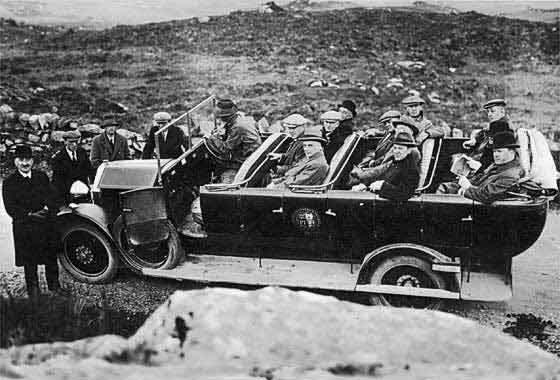 Photo is undated, no numberplate showing, and possibly 1912-14. -- Not older than 1914 because the radiator has a flat angle profile rather than curved. Our John Warburton knows the 16 and says the one in photo is smaller. Lights are oil but electrics were available and probably standard by about 1914. We think French ca 1913 Darracq 12HP Tourer. Lovely photo received from Ronnie Gamble (UK) trying to identify the car of a contractor from Coleraine County Londonderry, NI. Identifying the car would help date the photo for a book he is writing. -- LE 6420 was issued by London CC early 1912. Regret not possible to ident early cars by bodywork as made by other coachbuilders. While 'steamers' are not our specialty, we are relatively sure that the Roller in the photo is a Marshall. No reg. no. but rear wheel suggest period 1915-20, or earlier. 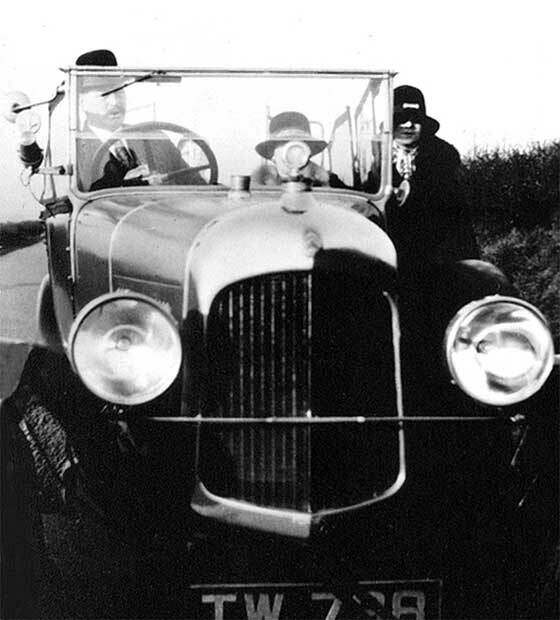 Another dramatic cinema screen grab of a vehicle which appeared in a 1936 British science fiction film "Things to come" produced by Alexander Korda. The screenplay was written by H. G. Wells and is a loose adaptation of his own 1933 novel "The Shape of Things to Come"; interestingly involving, in a future 1970, of building a civilization, based in Basra, Iraq, that has renounced war and outlawed independent nation-states! Got that one bit wrong? -- Car is cca 1920 Metallurgique. Four unusual photos received from Bernard de Grand Ry (Belgium) showing cars which had belonged to his great father. Could we advise on name and type ? -- As bodies are very similar they may have been made by the same coachbuilder. However we have received no feedback from Bernard. 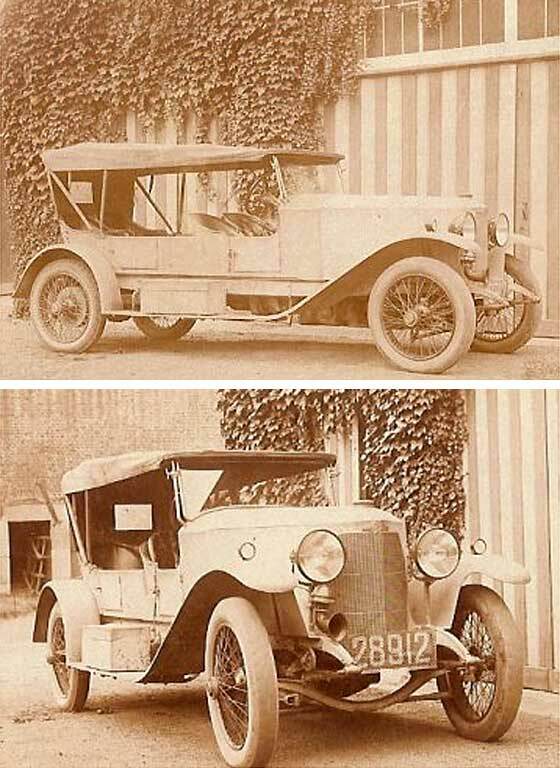 The first two photos show a cca 1922 Austro Daimler AD6/17 Tourer. Info has been confirmed by Austro Daimler's Gerhard Weinzettl, and John Warburton who suggests French Med look. Glorious photo received from Juha Kaitanen Turku (Finland) found in a local classic car magazine called "Klassikko". They were asking after the make of the car and he thought it was perhaps a Steyr. -- While Steyr did have 'spitzkuhler' radiators, they did not have the overhang. This is yet another wonderfull example of what can be done with a cca 1921 Ford Model T. This is a smart 'tulip' bodied tourer much favoured in Teutonic areas, and which was probably custom made locally in Finland. 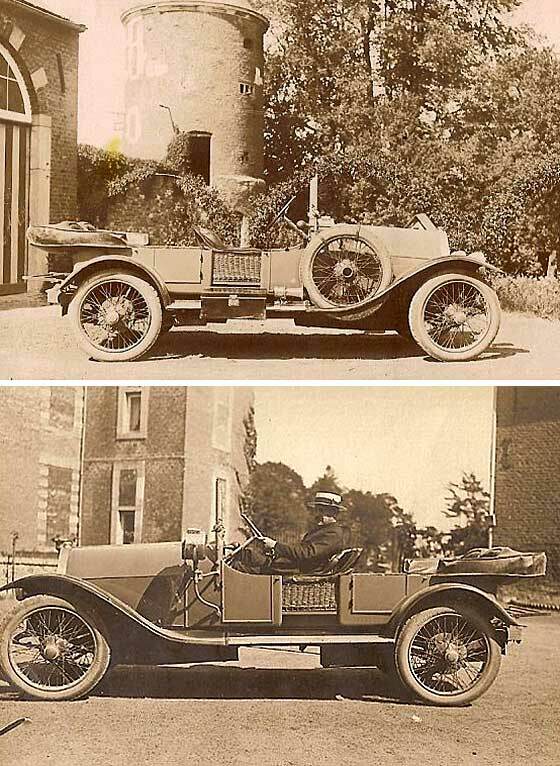 Four unusual photos received from Bernard de Grand Ry (Belgium) showing cars which had belonged to his great father. Could we advise on name and type ? -- As bodies are very similar they may have been made by the same coachbuilder. However we have received no feedback from Bernard. John Warburton thought a type 30 but John Staveley of Bugantics indicated that detail evidence suggests it a cca 1922 Bugatti Brescia long chassis 16 valve 4-cylinder probably Type 23. A little grainy photo submitted by Jesse Sleepeer from Boston (USA) saying it was a car that no one could identify. 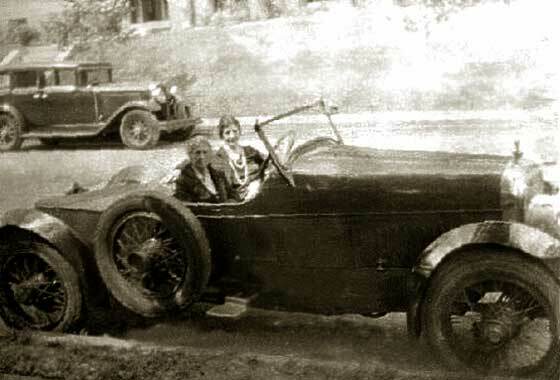 -- Our friends at the AACA have helped to identify this as a cca 1922 Cunningham DePalma Speedster. Cunningham, 1838 to 1936, were a luxury car maker in Rochester NY. 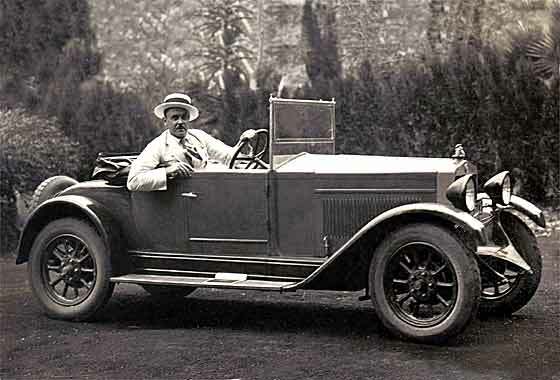 In 1919 famous racing driver Ralph De Palma made a record-breaking run in a Cunningham stock car at speeds over ninety-eight miles an hour, giving name to speedster. For rich clientele! 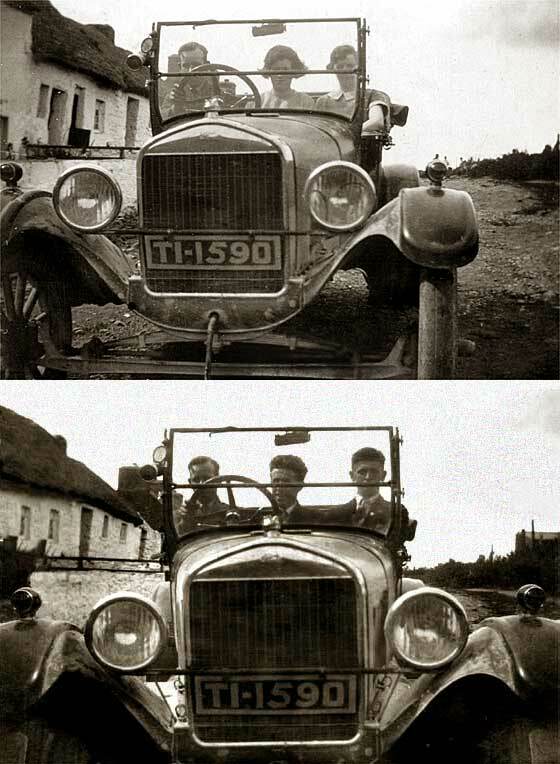 Photo submitted by Edward Lawrence (UK) showing Grandfather's Citroen Tourer which he owned circa 1928 -1930. 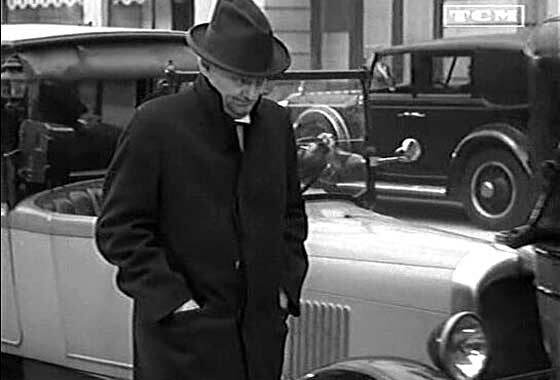 Edward wondered if the car exists today and whether our club has any records relating to it. -- Registration TW738 was issued by Essex County Council between 9'25 and 6'27. Probably made in Slough. It is not on the Vintage Citroen Register. Quick check with the DVLA records show that they too do not have it in their records. It is therefore likely it may not have survived. Period photo submitted to Rootschat by Eileen (UK) showing.Uncle Eddie and Aunt Nora. 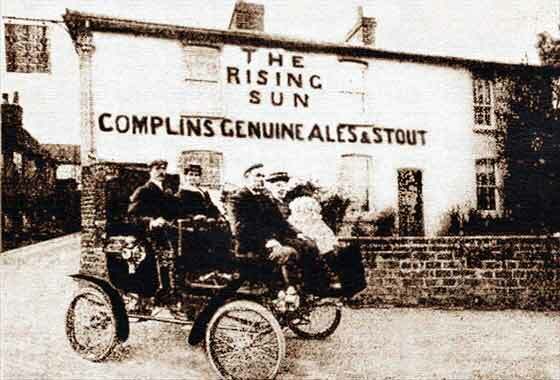 It was taken in 1925 somewhere around Westport in Ireland. -- The registration TI 1590 was issued by Limerick County Borough Council but unfortunately date-relative data has been lost. Our US friends suggest headlight bar makes it at least April 1926 production, so the car in the picture is a 1926 Ford Model T Tourer. Right-hand drive, so car was probably manufactured in UK, Manchester. Earlier pictures now received from Jayne Shrimpton (UK) of the Practical Family History magazine for our reconsideration after no luck earlier. -- Looking at this again suggests this is a cca 1926 Ford Model T Special. I noticed the dished steering wheel, also seems to have transverse springing and long extended hubs. Rounded bonnet so post 1919 and pre 1927. Many Ts had non standard bodywork to make them stand out. Disc wheels. Similar special was featured on Help Page 7. Earlier pictures now received from Jayne Shrimpton (UK) of the Practical Family History magazine for our reconsideration after no luck earlier. -- Radiator with crisp edges part hidden suggested Lancia. Signwriting says Great Southern Railways, railways of Eire. Formed by amalgamation in 1924 and also had a bus division in 1926. 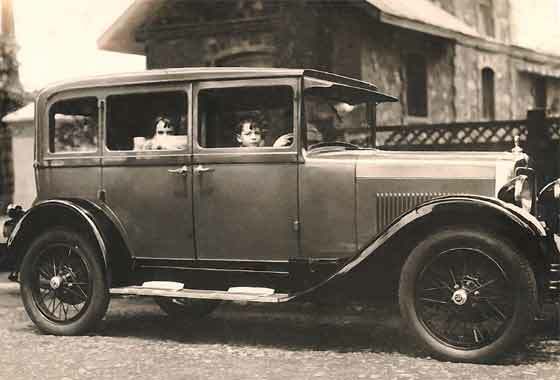 Investigation of all vehicles purchased in 1927 started with seven Lancias, with undefined bodies. This is therefore likely a cca 1927 Lancia Charabanc. 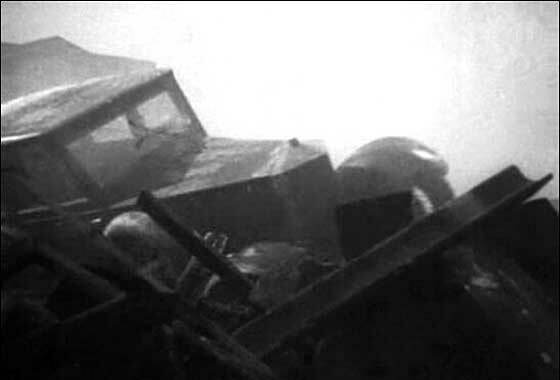 Another cinema screen grab of a vehicle which appeared in a 1936 American science fiction film "The Devil-Doll" starring Lionel Barrymore. An escaped Devil's Island convict uses miniaturized humans to wreak vengeance on those that framed him. -- This is a cca 1927 Citroen B14 Landaulette Taxi. The B14 Taxi was made between 1926 and 1928 and replaced the B2. The B14 range of cars was actually to be called B13 but Andre Citroen changed this at the last moment. One of three photographs received from Patrícia Carvalho or Paula Roque, we know not which, nor what country she/they were writing from. We have tried emailing to find out more but have received no replies. It is always a shame when our work gets no feedback. All we know is that the cars belonged to her Grandfather and that they were photographed in Mozambique in Africa during the 1920s, fascinating in its own right. We can advise that this car is a cca 1927 Fiat 509 Spyder. One of three photographs received from Patrícia Carvalho or Paula Roque, we know not which, nor what country she/they were writing from. We have tried emailing to find out more but have received no replies. It is always a shame when our work gets no feedback. All we know is that the cars belonged to her Grandfather and that they were photographed in Mozambique in Africa during the 1920s, fascinating in its own right. We can advise that this car is a cca 1928 Erskine 6 Sedan. 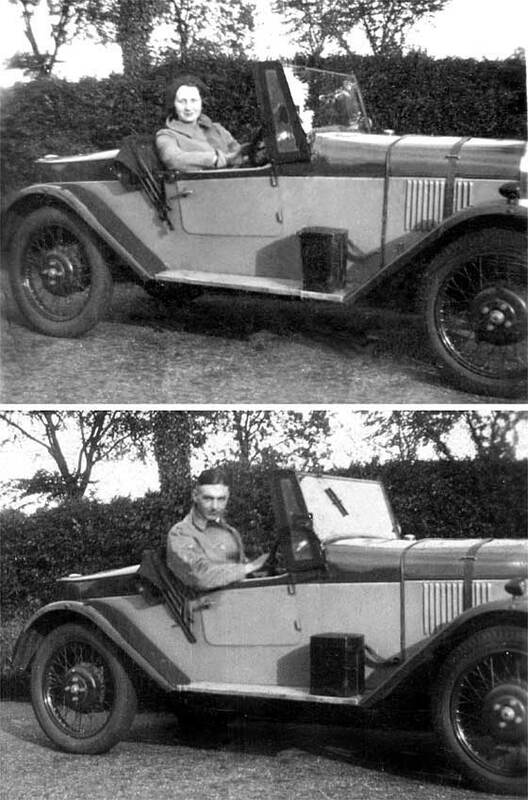 Photo submitted by Alison Hall (UK) trying to find out make of her grandfather's car taken in around 1937. -- Our Singer expert Simon Bishop and his colleagues confirmed this was a Singer but advised it was a cca 1929 Singer Porlock following the 100 ascents of Porlock on 28th Dec 1928, after which it was named; looks remarkably similar and could be the Deeley-s posing in their Junior before it was called a Porlock. Allision's positive dating of photo cca 1937± does dispel the possibility. Photo received from Kitty Ellison of Florida (USA) showing her great aunt, the youngest, and on the far right is the mother, Kitty's great-grandmother. Photographed possibly Indiana, USA. 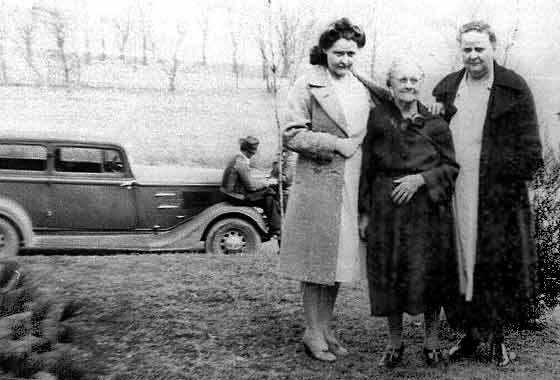 Knowing the year and model of the car might help identify oldest woman. -- The give-away on the car is the three section louver system. Two rear sections have a chrome strip and can be opened. The front section is a series of fixed louvers. Can only be 1934 Plymouth Six Sedan Model PE. Period photo submitted to Rootschat by Martyn from Perth (Australia) probably taken around Fermoy in Ireland. He would love to find out what car it is and the year of the pic. -- The recognition feature when all else is missing are the twin tapered air vents with molded ends. The car is a cca 1935 Standard Twelve Saloon. These were made between 1934 and 1936. There was a smaller Standard Nine. The peculiar 'leaning' stance of the people suggests straightened picture was taken on a hill. Moody photo received from Stephen A. Barneby currently in (Iraq) with the Regional Reconstruction Team in Erbil. 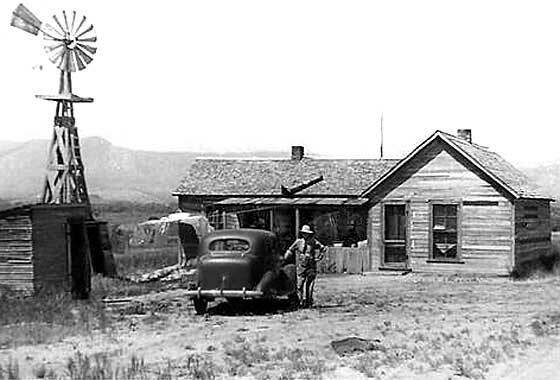 The photo is romantically entitled Gunbarell Hill, Boulder, Colorado and Stephen believes the picture was taken in the late 30's. He assumes that it was not a very expensive model, as the family had very little money. 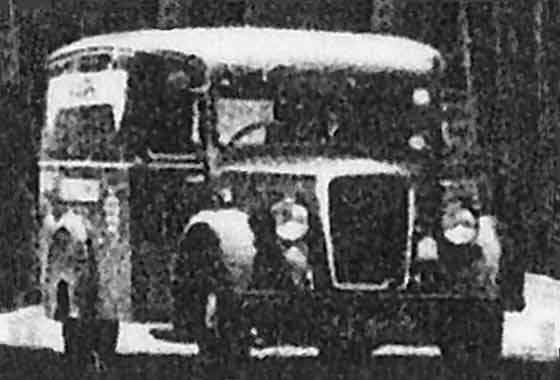 -- The photo was very small and low resolution so identification cannot be definite but our Friends at AACA think it is a cca 1936 Chevrolet Master series. Photo submitted by Chris Dell (UK) saying he wondered if we might be able to identify/date the van in the picture. He knows the picture is very poor, but it is all he has, being taken from a larger picture. -- This one was surprisingly difficult in view of the popular make it was. With assistance of our Chas Moody, we nailed this to a cca 1939 Morris Series 2 10cwt Van. 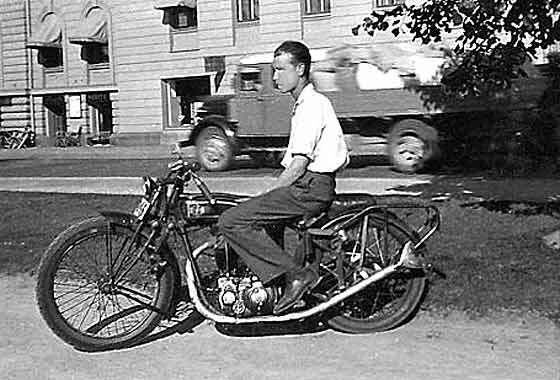 These were made 1935 to 1939, had an offset starting handle and sidevalve engine, and the last to have centre throttle pedal. Interesting photo sent in by Tedscout (Australia) after an enquiry to Rootschat about a BSA Motorcycle. Photo shows his mother standing next to a 'Bond'. -- I did not know about the Minibyke but seems this was made by the same company that made the Bond three wheeler car, and some other strange scooters and motorbikes. Photo is too small to confirm reg but it could be HAY or MAY or WAY. AY is Leicester CC and build dates are 49 to 53, so only the HAY fits a cca 1951 Bond Minibyke. 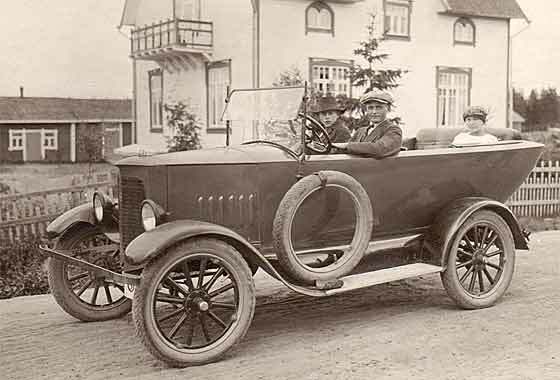 Another of a number of very interesting photos submitted by Jan Lundin (Sweden) showing vehicles in the 20s and 30s Scandinavia, for which he is seeking identification and dating, and specifically if it was English. -- This one has done the rounds of our usual motorcycle experts without identification. Bike and engine definitely not British. Contacted in 2016 by Michiel Huisman (secretary of the Dutch VMC) who advised this is a Belgian cca 1925 FN M60 350cc motorcycle modified for racing.